If you haven't done so yet, now would be a good time to review the Project Templates section of the Working With Projects guide. A new Dradis project is a blank slate. Project templates are a great way to kick-start the project with some default content. The easiest way to create a custom project template is to create a "dummy" project to use as your template. Create a project with the fields you want to see in all future projects. Prepoulate Nodes, assign a Methodology, do as much or as little customization as you want. Within that project you created, navigate to Export results in the top menu bar. In the export manager, select Project Export and as template. Click the blue Export button to download the project XML file. 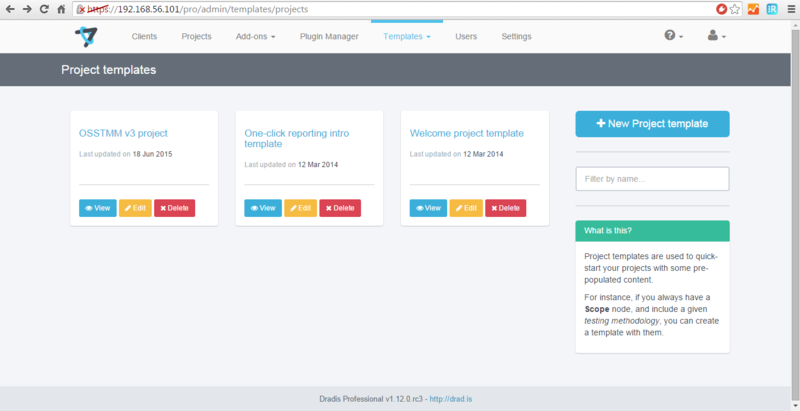 Now, click Change Project in the top menu and navigate to Templates > Projects. Click New Project Template in the right-hand sidebar. Delete the default content in the New Project Template. Open the XML file you just downloaded using your favorite text editor. Copy the text of the entire project XML file from your local system and paste it into the content section of your blank New Project Template on Dradis Pro. Click Create Project Template to save the new template to Dradis Pro. Is the name Name is undefined please define a name for this template? If so, just click Edit and change the <name></name> section of the project template. Navigate to Projects Dashboard > Templates > Projects. Click the yellow Edit button beneath the correct project template. Make edits to any aspect of the project template. Click Update Project Template to save your changes. 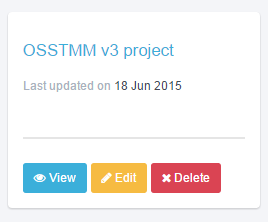 Click the red Delete button beneath the correct project template. Confirm that you do want to delete this template. In the interest of keeping information organized, I'm going to have to ask you to open the Project templates page of the Working with projects manual that explains how to choose a template when creating a new project. We want to ensure that the latest and most up-to-date information about each topic is in a single page.